HomeMembershipWhat’s in a CSA Box? We have been CSA growers for over a decade now and know how to put together a box of diverse vegetable items in a usable quantity that pair well with each other (for example: beets and fennel, dill and cucumbers, kale and butternut squash). 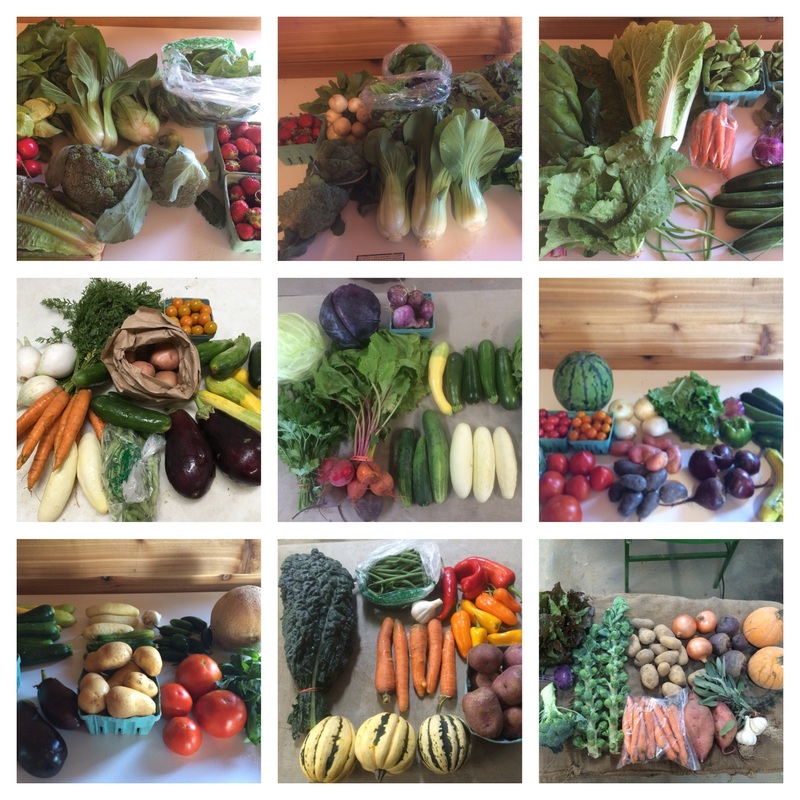 Our CSA box typically has 8-12 seasonal produce items harvested at the peak of freshness and nutrition. A sample Spring Box contains: 1 bunch of greens (kale, bok choy, or Swiss Chard), ½ pound spinach, 2 heads of lettuce or 1 head of lettuce and ½ pound lettuce mix, 1 bunch of scallions, ¾ pound of broccoli, 1 bunch of radishes or japanese turnips, 1 bunch of carrots, and 2 pints of strawberries. A Sample Summer Box holds: 1-2 heads of lettuce, 1 bunch of herbs (either dill, cilantro, or basil), 1 bunch of beets, 1 pound of green beans, 1 pound of sweet white onions, 2 pounds of cucumbers, 2 pounds of summer squash and/or zucchini, 1 cantaloupe or 1 watermelon, 2 pounds potatoes, 1 green bell pepper or 2 eggplant, 3-4 pounds of tomatoes, and 1 pint of cherry tomatoes. A Sample Fall Box has: 2 head lettuce, 1 bunch of greens (kale, bok choy or Swiss chard), ½ pound of spinach, 1 pound of yellow onions or 1 bunch of green onions, 1 garlic, 1 pound of root vegetables (carrots, beets or radishes), 2 pounds of sweet potatoes or 2 pounds white-flesh potatoes, 2-3 pounds of winter squash (either spaghetti, acorn, delicata or butternut), 1 bunch of herbs (dill, cilantro or basil), 1 pound of green beans, 1 pound of sweet, color peppers, 1.5 pounds of broccoli or cauliflower, and a head of green or red cabbage.